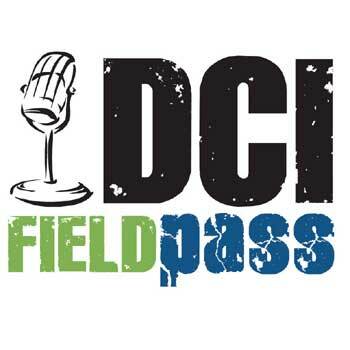 This week's "The Field Pass with DCI's Dan Potter" audio feature for DCI Season Pass subscribers has been posted. You can either download the feature or simply stream it! Cool! Listen to a free, two-minute sample. The Field Pass with DCI's Dan Potter is a half-hour audio magazine featuring the performers, designers, instructors and fans of the world's top drum corps. Season on! Grab your Field Pass and let's go to the stadium! Contents of The Field Pass, Vol. 6 – Aug. 3: History is made in Indianapolis as the Cadets get by the Cavaliers by one of the narrowest margins ever. Meanwhile, Santa Clara Vanguard finds itself where it's never been before -- in a season that is now less about the numbers and more about Vanguard pride. Rookie Leah Stanfield shares the pain of being cut and the joy of getting back in the show in our special series, "One Rookie's Story." The Voice of DCI, Brandt Crocker, is our special guest in our "Box Five" interview. And, fans tell us what they'd like to ask a DCI judge. Dan Potter is well-known to DCI fans as a frequent field announcer. If you're a Season Pass subscriber, login and look under the Summer Coverage pull-down menu. Remember when. Live it now. One pass. One place.